IF YOU'RE an avid user of the Bruce Highway and have recently taken a trip, you may have noticed something a little different along the way. Trivia signs implemented between Gympie and Tiaro to help drivers stay alert have finally been updated after two years. A Transport and Main Roads spokesman said the questions were updated as funding became available. "The trivia's purpose is to help drivers remain alert by keeping their mind active," they said. 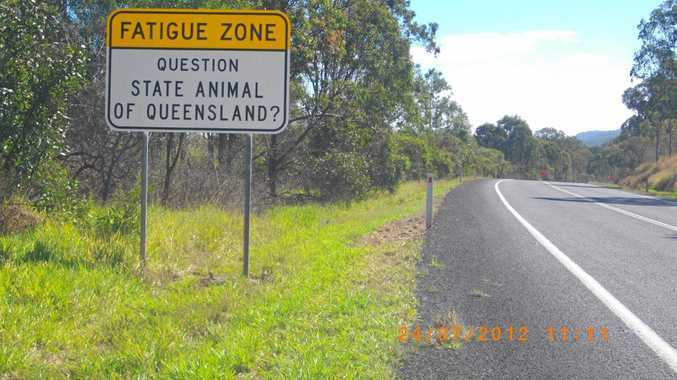 "The trivia sign roll-out was initiated following consultation with Queensland Police in an effort to manage fatigue and improve safety at various locations along the highway. Wide Bay Burnett currently has three trivia questions and answers north of Gympie first installed in 2012 and another three north of Gin Gin. The questions are related to Queensland and focus primarily on the local Wide Bay Burnett area. "Road safety is everyone's responsibility and we all have a role to play in making our roads safer," the spokesman said. "It is important to never drive tired or distracted, always stick to the designated speed limit and drive to the conditions." A town that whales visit? A place to see turtles hatch? You'll have to drive along the Bruce Highway or visit the region to find out.